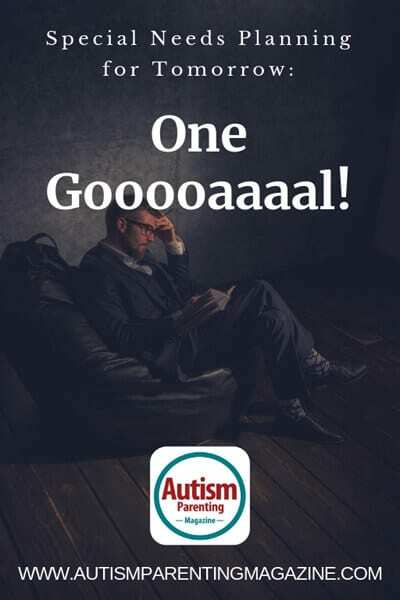 Special Needs Planning for Tomorrow: One Gooooaaaal! a. What type of supports will they need? b. Where will those supports take place (in your home, in their home, in a supported living environment, group home, etc.)? c. Who will help provide those supports (people, organizations, etc.)? Which benefits will provide the services your child needs? 4. Incorporate a Special Needs Trust into your child’s plan, as well as an ABLE account. For more information on the topic of Special Needs Planning, please visit www.ASpecialNeedsPlan.com or join our Two Minute Video Tips at www.HowToSecureTheFuture.com. For more information on how to prepare for the future, be sure to contact a financial advisor who specializes in serving families with special needs. A Special Needs Plan is driven by their purpose of leading families to independence through an on-going multi-generational plan. A Special Needs Plan is passionate about families confidently moving forward. Ryan F. Platt, MBA, ChFC, ChSNC, is a registered representative of and offers securities, investment advisory, and financial planning through MML Investors Services, LLC, member of SIPC. A Special Needs Plan is not a subsidiary or affiliate of MML Investors Services, LLC, or its affiliated companies. This article is not a recommendation or an endorsement of any products.